Reindert Overduin in his studio with a student from CFA. Saint Quentin la Poterie, a village near Nîmes with twenty-four pottery studios, has a long history as a pottery centre (tiles in the Pope’s Palace in Avignon were made there), but by 1970 all the traditional workshops had closed. Its revival is due largely to the energy and vision of Nicole Bouyala, its formidable mayor. Mme Bouyala, who held office from 1983 to 2001, encouraged potters to set up there, created the gallery Terra Viva, the European ceramics festival Terralha, a museum of ceramics and a Centre for Arts and Crafts Training (CFA), the only training centre for ceramics in the Gard or Hérault. The studios and shops along the pretty streets have turned St Quentin la Poterie into a village with a cosmopolitan population and the resources of a city, with national accreditation as a Ville et Métiers d’Art (arts and crafts town). 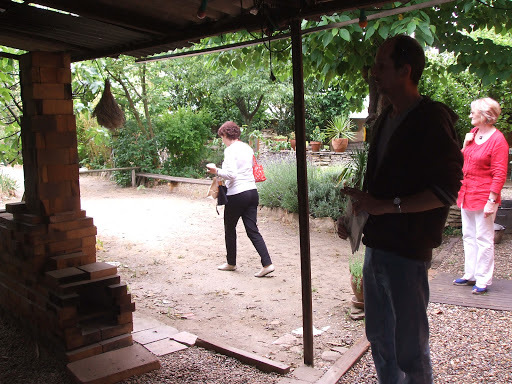 I visited the studios of four potters – Reindert Overduin, Denis Grazon, Agnès Alex and Marine Maudet – and asked them how they came to set up in Saint Quentin la Poterie. Like all the potters in the village, Reindert Overduin is not local. He was born in Holland, where he went to art school, came to France for a holiday and liked it so much that he stayed. He visited St Quentin la Poterie, worked in Lilou Milcent Gallot’s studio for a day and decided to study ceramics seriously. He trained at CNIFOP, the National Centre for Training in the Ceramic Arts in Burgundy, from which many French ceramists have graduated. CNIFOP offers one-year modules that can be taken alone or combined into a longer course, plus numerous specialist short courses. After CNIFOP, Reindert returned to San Quentin la Poterie to work with Patrick Galtié, who has the largest workshop and the only one with permanent employees. He is still fascinated by kilns and firing. 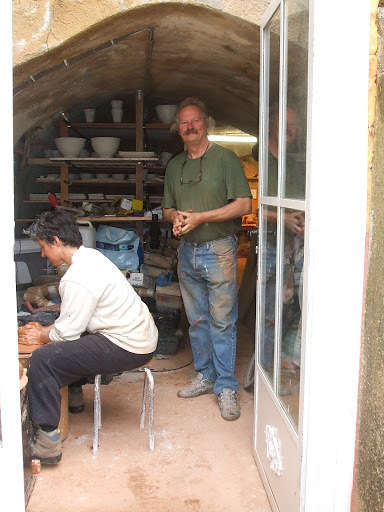 He has five gas and wood-fired kilns, including raku kilns, a fast-fire wood kiln and an open fire, low temperature kiln for the courses he runs in primitive firing – “Original pottery from the original kilns”. His studio is called L’Age de Faire, a pun on “making” and “iron age”. Agnès Alex and Marine Maudet share a studio making work that differs from everything else made in St Quentin la Poterie, simple, white and austere. In 2003, Agnès came from Paris to study at the CFA, then took an apprenticeship with Lilou Milcent Gallot, who has trained several of the potters here. Two years ago, before setting up, she had a show in Paris to see if her work would sell and was encouraged by the response. She and Marine were helped by the council to find premises for their studio. They like to progress slowly, ensuring that each step they take is well established before they move on to the next one – first their studio, then their shop, then their blog. They sell only from their shop now and will consider later whether to sell in Paris as well. At a Saturday night dance in the village, I spoke to Lilou Milcent Gallot, one of the first studio potters in St Quentin la Poterie. She told me that the future of ceramics is uncertain there. The potters are getting older and the success they have made of the village has pushed up property prices. The council is now promoting other activities. That evening in the market square, there was a pop-up bar, a raku demonstration and a Latin American accordion band. There was a mix of established locals and people who have chosen the relaxed pace of this Occitan village in preference to the pressures of the metropolis. The community spirit among the potters is well known and many more want to set up here, so hopefully it will survive and grow.